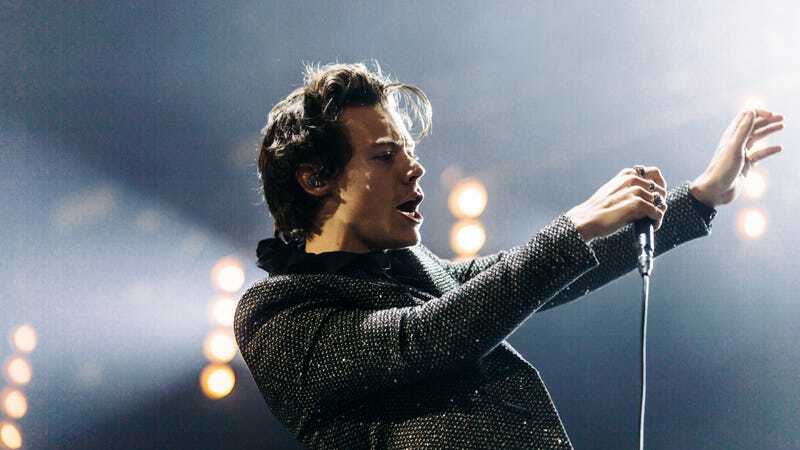 Former One Direction heartthrob Harry Styles played two unreleased songs at a concert in Basel, Switzerland Sunday night—“Anna” and “Medicine.” Since the event, his fans have worked to transcribe the lyrics from video footage that’s surfaced online and using said lyrics to speculate about the 24-year-old singer’s sexuality. Y’all, like, I get it—the Babadook is a gay icon, and Kendall Jenner is an ironic gay icon, and you should find joy where you can, etc., all of that. But does that apply here? The lyrics to Harry’s song “Medicine” go something like this: “The boys and the girls are here / I messed around with them / And I’m okay with it.” (Some people are arguing on the song’s Genius page that it’s actually, “I messed around with him / And I’m okay with it”—it’s hard to tell from the video clips on Twitter.) If this is Harry’s way of coming out, then more power to him—fans have been wondering if Harry is into men for years, going back to when he was in One Direction and rumored to be dating bandmate Louis Tomlinson. But it might not be any of that, and that’s okay too. We should, like, wait and see what he says! However, once an artist puts out a song, fans are free to do whatever they want with it, and if people want to read “Medicine” as a song about bisexual romancing and flirtatious nights out at the club, that’s great. But until Harry Styles says, “Hey, I date men,” or “Yeah, I’m gay,” we shouldn’t read this as strictly autobiographical. Maybe he’s experimenting, and it would be rude to assume what the conclusions of that will be..but also, who cares? It’s 2018.